The Upper West Side was settled by Dutch immigrants in the early and mid-seventeenth century, though not without resistance from the Munsee Indians living on the north end of the island of Manhattan. Warfare with and raids by the Munsees temporarily ended the northward expansion of the Dutch settlers in the 1650s, leaving them with a stretch of land north of the city known as Bloemendal (“Bloomingdale” in English: ‘valley of flowers’). In the late 1700 and 1800s, the little hamlet of Harsenville spanned 68th Street to 81st Street between Central Park West and the Hudson River. 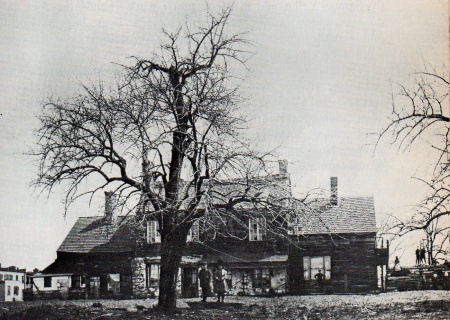 It got its name from Jacob Harsen, a farmer who settled there in 1763.This is his house below, at today’s Tenth Avenue and 70th Street, in an 1888 New-York Historical Society photograph. Other farm families followed, and soon, a real town formed. Harsen's Lane was a country road which connected the Village of Harsenville (70th St.& Broadway) with the eastern part of the Island; it commenced at the Bloomingdale Road (the present Broadway) b/w 71st & 72nd streets. & ran easterly about on line of the present 71st & ended at the Middle Road, the present 5th Ave & 71st. Sherman Square at the south end of the intersection of Broadway and Amsterdam Avenue is named after General William Tecumseh Sherman (1820 - 1891). Parks records indicate that the site once held a water trough for horses at its northern tip. At one time the streets of Manhattan were frequented by thousands of horses on a daily basis. Equine transport was the principal means of conveying goods throughout the city, and numerous watering fountains and troughs could be found along thoroughfares and traffic intersections. Many were erected by humane societies such as the American Society for the Prevention of Cruelty to Animals (ASPCA). Besides serving a necessary function in preserving the health of beasts of burden, these roadside fountains often exhibited a degree of artistry in their design and ornamentation. The decline of horse-drawn commercial vehicles brought the virtual elimination of these fountains by World War II. A bronze tablet honoring those who perished in war was donated by the Grand Street Boys American Legion Post and dedicated on Veterans’ Day in 1954. Today the site is beautified by a small rose garden. In addition to this diminutive oasis on a busy stretch of Broadway, General Sherman is also commemorated with a monument in Grand Army Plaza in Manhattan (1903), with a bust at Grant’s Tomb in Riverside Park (1938), and at nearby Tecumseh Playground. At the current site of the One Sherman Square building stood two separate buildings, The Sherman Square and The Regent. In 1902 The The Sherman Square bought The Regent for $900,000 and renamed the combined sites to the Sherman Square Hotel. You can read the original New York Times article from 1902 here. If you interested you can see an advertisement for the Sherman Square Hotel from the New York Tribune in July 16, 1916 here (this is a large file), the advertisement is in the top right corner. Here are some old photographs of the area and Sherman Hotel. In his book, "Upper West Side Story, A History and Guide," (Abbeville Press, 1989), Peter Salwen noted that the famous general "retired to West 71st Street in 1886, looking for peace and quiet, which he said could be had only in the forest or in a great city." He soon was one of New York's great toastmasters and first-nighters, taking the el, which he preferred to a private carriage, to the theater district (then at 23rd Street) or to the Players club, the theatrical club on Gramercy Park, which he helped found in 1888. After his death in 1891, the nearby intersection of Amsterdam Avenue and the Boulevard was named Sherman Square. While still in the military in 1864, Gen. William Tecumseh Sherman and his Union troops swept into Savannah. They burned Atlanta to the ground, but General Sherman, at the end of his "March to the Sea," found Savannah so beautiful that he telegraphed President Abraham Lincoln on Dec. 22, offering him the city as a Christmas present. Besides the square, General Sherman is also commemorated with a monument in Grand Army Plaza in Manhattan (1903), with a bust at Grant’s Tomb in Riverside Park (1938), and at nearby Tecumseh Playground.